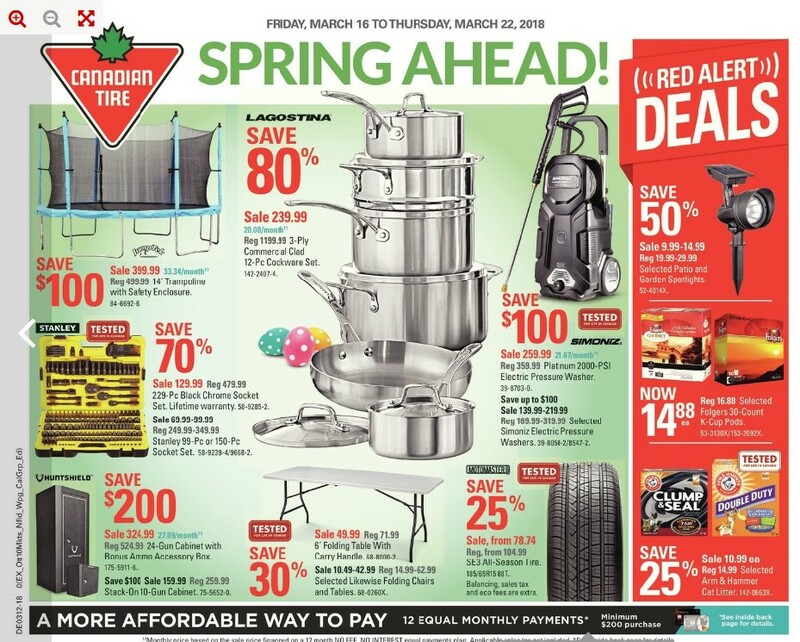 Canadian Tire Flyer Weekly Flyer Spring Ahead 3/16/18 - 3/22/18 - This flyer is the preview for the deals which be valid on Friday. 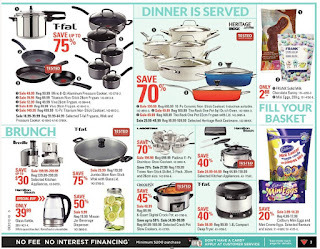 You can shop these products for the great prices values shown in the Canadian tire flyer. 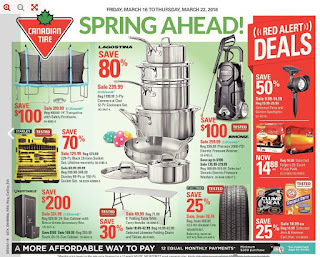 Spring Ahead Canadian tire 2018 on Cover page Jumptek 14' Trampoline with Safety Enclosure #84-6692-6 $499.99 Regular Price $399.99 Sale Price $100.00 Savings $33.34/month. Lagostina 3-Ply Commercial Clad 12-PC Cookware Set #142-2407-4 $1199.99 Regular Price $239.99 Sale Price 80% Savings $20.00/month. Stanley 229-PC Black Chrome Socket Set #58-9285-2 $479.99 Regular Price $129.99 Sale Price 70% Savings Tested for life in Canada. Lifetime warranty. 6' Folding Table with Carry Handle #68-8000-2 $71.99 Regular Price $49.99 Sale Price 30% Savings Tested for life in Canada. MotoMaster SE3 All-Season Tire #185/65R15 88T $104.99 Regular Price From $78.74 Sale Price 25% Savings Tested for life in Canada. Balancing, sales tax and eco fees are extra. 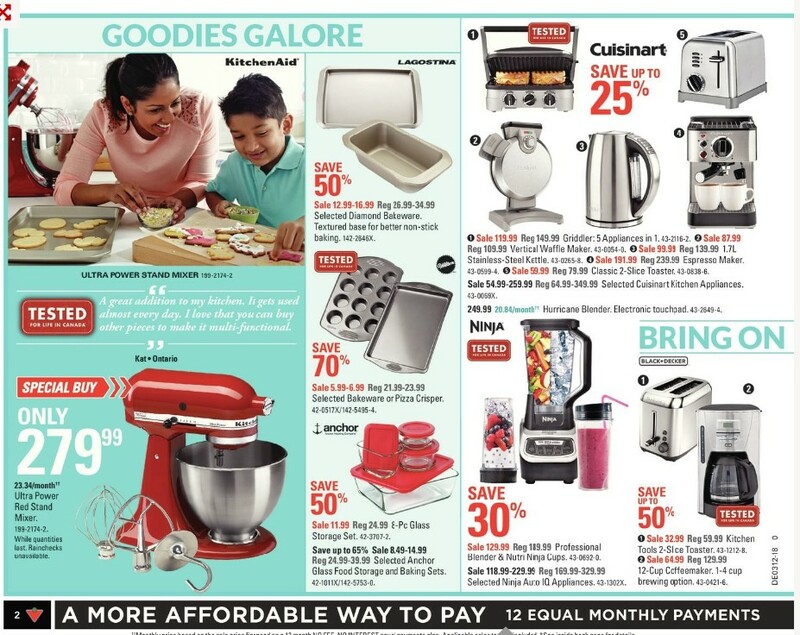 KitchenAid Ultra Power Red Stand Mixer Model #: 199-2174-2 $279.99 Sale Price $23.34/month. While quantities last. Rainchecks unavailable. Lagostina Diamond Bakeware Model #: 142-2646X $26.99 - $34.99 Regular Price $12.99 - $16.99 Sale Price 50% Savings Textured base for better non-stick baking. Wilton Bakeware or Pizza Crisper Model #: 42-0517X/142-5495-4 $21.99 - $23.99 Regular Price $5.99 - $6.99 Sale Price 70% Savings Selected. Tested for life in Canada. Cuisinart Griddler 5 Appliances in 1 Model #: 43-2116-2 $149.99 Regular Price $119.99 Sale Price Up to 25% Savings Tested for life in Canada. Cuisinart Classic 2-Slice Toaster Model #: 43-0838-6 $79.99 Regular Price $59.99 Sale Price Up to 25% Savings Flat side for space-saving positioning. Cuisinart Vertical Waffle Maker Model #: 43-0054-0 $109.99 Regular Price $87.99 Sale Price Up to 25% Savings Unique fill spout and measuring cup eliminate overflows. 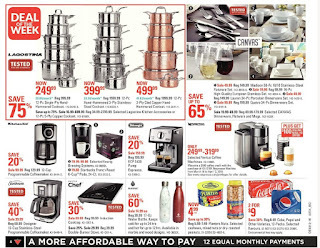 Cuisinart Stainless Steel Kettle Model #: 43-0265-8 $139.99 Regular Price $99.99 Sale Price Up to 25% Savings Auto shutoff and boil dry protection. 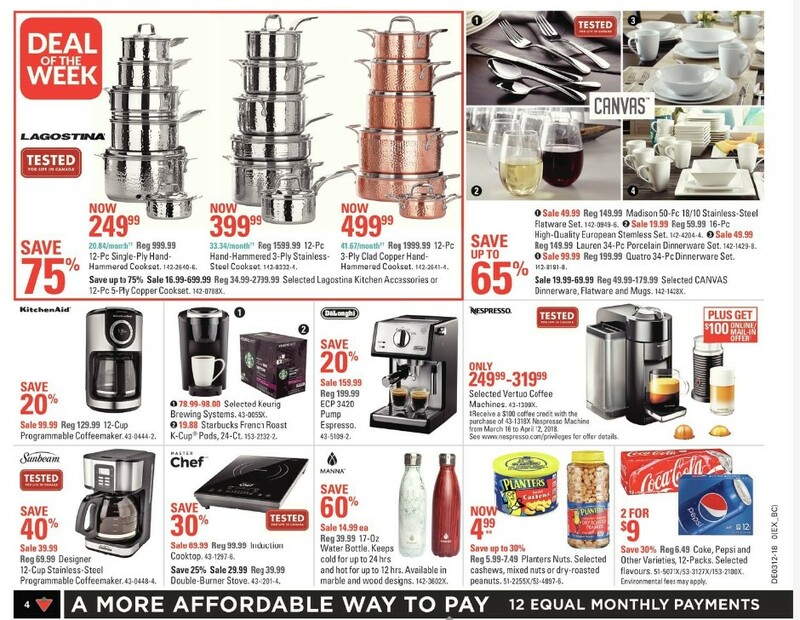 Cuisinart Espresso Maker Model #: 43-0599-4 $239.99 Regular Price $191.99 Sale Price Up to 25% Savings Brews one or two cups using ground espresso or pods. Ninja Professional Blender & Nutri Ninja Cups Model #: 43-0692-0 $189.99 Regular Price $129.99 Sale Price 30% Savings Extra large 72 oz blender pitcher. 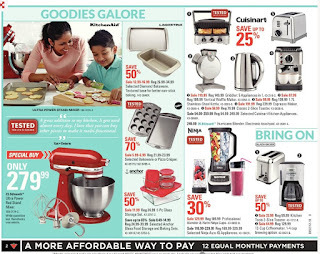 Black + Decker Kitchen Tools 2-Slice Toaster Model #: 43-1212-8 $59.99 Regular Price $32.99 Sale Price Up to 50% Savings Auto-off function turns toaster off when not in use. 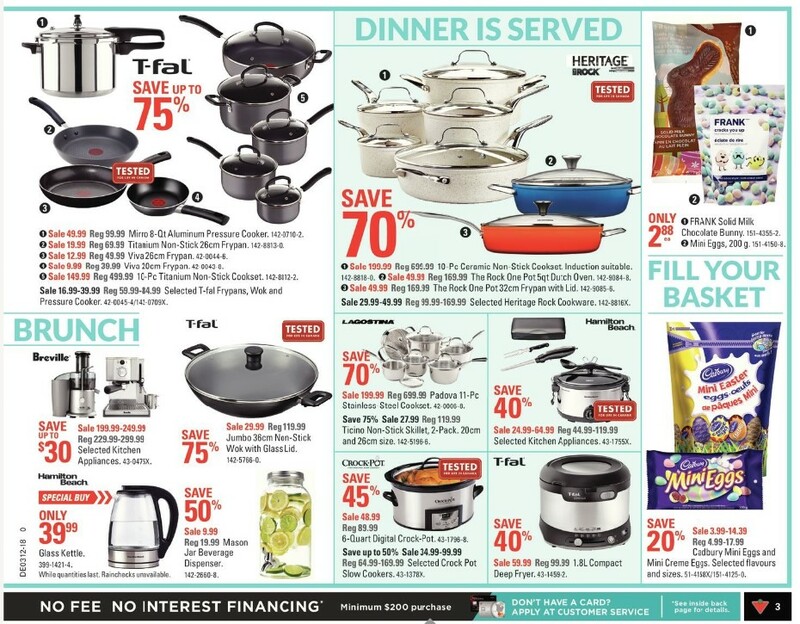 Deal of the week available on page 4 Lagostina 12-Pc Single-Ply Hand-Hammered Cookset Model #: 142-2640-6 $999.99 Regular Price $249.99 Sale Price 75% Savings Tested for life in Canada. $20.84/month. Lagostina 12-Pc Hand-Hammered 3-Ply Stainless-Steel Cookset Model #: 142-8332-4 $1599.99 Regular Price $399.99 Sale Price 75% Savings $33.34/month. Lagostina 12-Pc 3-Ply Clad Copper Hand-Hammered Cookset Model #: 142-2641-4 $1999.99 Regular Price $499.99 Sale Price 75% Savings $41.67/month.